This model generates a pulse train with a pulse value of 1. The pulse width is given by the parameter pulseLength. The mean time interval between two pulses is given by the parameter meanTimeInterval. The distribution of the time interval is uniform between [0, 2*meanTimeInterval]. With the parameter random seed you can choose to make the distribution variable or fixed for each simulation run. 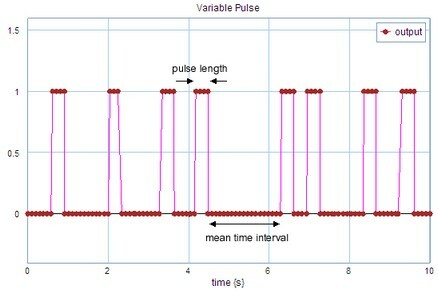 VariablePulse output with a pulse length of 0.3 s and a mean time interval of 1 s.